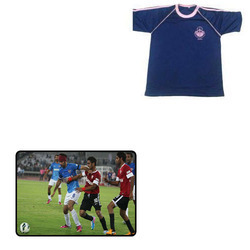 We are offering wide range of Football T-Shirts for Sports. The range offered by us is well designed using the best possible quality fabric and state-of-the-art designing technology. They are available in standard sizes and colors and can be customized as per clients preferences. Looking for Football T-Shirts for Sports ?